While we were attending the Fire & Ink LGBT conference in Detroit, USA, Zanele Muholi informed me that she had confirmed her presence at Amherst College, in Massachusetts from October 14-16, 2015. We travelled from the Detroit conference to New York City (NYC), where our bus to Massachusetts was to depart from. So we spent two days in NYC Metropolitan, which is home to millions of people from different countries and have different races and ethnic identities, which is not that different from Johannesburg, something that I’m used to. Muholi and I had an early start to our day on October 14, as we left Brooklyn and headed to 42nd Street on our way to the bus. After arriving at the city centre we were unsure whether to take a left or right turn and opted to ask someone who was dressed like one of the traffic officials. He gave us an unconvincing answer to take the left route, with scepticism in our hearts and minds we took his advice and hoped for the best. We arrived at the bus stop with some time to spare, as the bus had not arrived yet. I took the opportunity to finish my left over ribs from a restaurant in Chelsea and delicious oxtail which is my comfort American food sold at a Caribbean fast food restaurant in Brooklyn. The bus arrived and we boarded ready for the approximated 4-hour trip that lay ahead. NYC traffic didn’t disappoint even for a Wednesday morning. We were stuck in a bumper-to-bumper traffic jam while navigating our way out of the city. Many of my movements in NYC are on the subway, so it felt like I was on one of those tourist buses (which I always wish to ride) as I was sitting on the top part of the double decker bus. We eventually made it to the high way were the traffic was flowing smoothly. It was a little unnerving looking outside the window and realising how narrow the high way is, my biggest fear was the bus tipping over. As we neared our destination a beautiful landscape of some of the most beautiful leaves came into our view. Bright, vibrant and happy colours provided a pleasant sight for me and I think its safe to say to my fellow passengers. The place is so beautiful I think it can probably cure depression and turn any grumpy teachers, bosses and parents into happy people. We had a safe journey and just before our drop off spot the driver announced that those who were continuing to the last destination should wear their jackets. He should have given us the same warning as well, as soon as I stepped outside the bus I realised the temperatures were much lower than in New York. We had to wait briefly for our organised cab to pick us up and take us to The Lord Jeffery Inn, our home in Amherst. In the first few minutes waiting at the parking lot it became apparent that not many black or people of colour are in Amherst. I have proclaimed before, I fear for my life when I see white American police, I didn’t even have to see them, my paranoia just took over. The senseless racial killing of congregants from Emanuel African Methodist Episcopal Church in South Carolina reminded me just how the lack of gun control in the states poses a threat to people with my skin colour. I believe the two biggest threats to my life are my race and sexuality. When I have to travel in an African country I investigate homophobic incidents towards lesbians and their laws. For the USA and Europe I investigate their racism, I say this understanding that homophobic violence exists in these places as well, as evidenced by the high numbers of murdered trans women of colour in America. When I researched racism in Amherst the one incident that the media has covered is of Carolyn Gardner, a Math teacher from Amherst Regional High School. She has been the target of racist graffiti some of it found in the boy’s toilets at the school. In my thinking these kids must be getting this attitude somewhere, most probably home or other adults around them. So all I could do was pray for protection from my guardians and hope for the best, while in Amherst and the United States. We arrived at our temporary home and rested for the night, preparing for a busy day on October 15th. The following morning we made our way to Hampshire College, Muholi had a classroom lecture with students from the Department of Film, Photography and Video. The class was an intimate number of less than 10. Muholi conducted the session in a roundtable setup, which enabled everyone to face one another and contribute to the discussion. 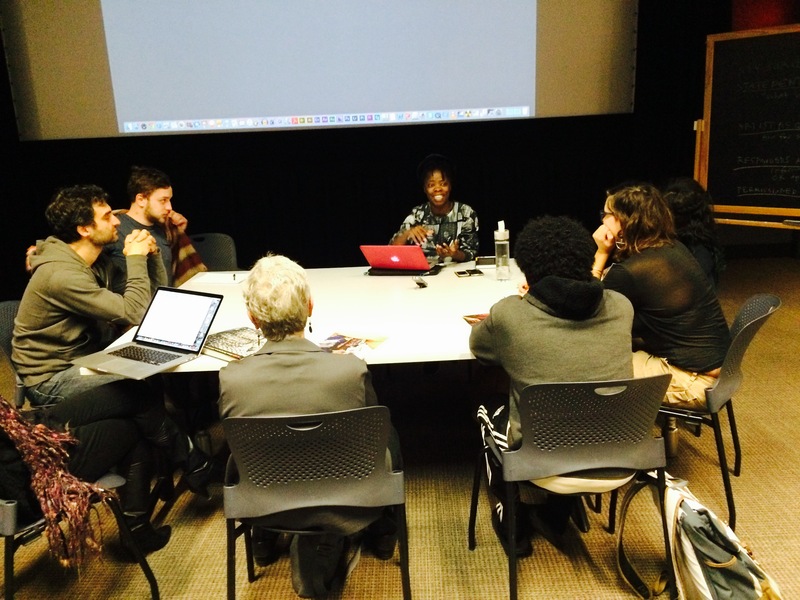 The intimate session allowed students to have a conversation with Muholi and ask her different questions, including the popular one where people ask if she is not worried that her work puts the participants at risk. The session also helped us to get some insight from another guest speaker, Jennifer Bajorek. She spoke about the sad reality of many African families that sell the photographs of their deceased relatives at the fraction of the price that they are then resold for in Dollars. Bajorek is a researcher and the founder of a non-profit organization called “Resolution” it is dedicated to photography and photography collections in Africa. Following that enlightening conversation, we had a little less than an hour to make our way to another campus and meet with students from the Department of Feminist Studies at Hampshire College. Female students dominated this class; we found them already seated and waiting for Muholi to present. With the lights dimmed, students watched silently as Muholi projected a documentary and her photographs. The only disturbing sound came from a student who kept taking aggressive bites from an apple. Although we were tired and starving, our minds were on the last event of the day, which was a public lecture at Pruyne Lecture Hall later that evening. The lectures sponsored by the Department of Art, the History of Art, as well as the Interdisciplinary Studies Institute at UMass Amherst College were a success and well attended. This entry was posted in Another Approach Is Possible, Archive, Archived memories, Article by Lerato Dumse, Conversation, Creating awareness, Education, Expression, Fire & Ink LGBT conference, From Johannesburg to Massachusetts, Guest speaker, Hampshire College, Intergenerational mo(ve)ments, Jennifer Bajorek, LGBTI politics, Life, media, New York City (NYC), New York upstate, Photography and Video, Power of the Voice, Presentation, Pruyne Lecture Hall, Race and Sexuality, Resolution, Students, Travelogue, USA, We Are You, We Care, We Still Can with/out Resources, Writing is a Right, Zanele Muholi Amherst College visit and tagged Attitude, Beautiful, Being recognized, Black lesbians, Collaborations, ethnic identities, Experience, Feelings, Friendships, homophobic incidents, Human beings, human rights, Inkanyiso media, Photography, Questions and Answers, Relationships, Respect, Sexuality, Transportation, Visual activism, Visual history, Voices, Words, Zanele Muholi. Bookmark the permalink.